FRANKFORT, Ky. -- With the chants of hundreds of teachers ringing in their ears, Kentucky House lawmakers voted Friday to override the Republican governor's veto of a two-year operating budget that increases public education spending with the help of a $480 million tax increase. 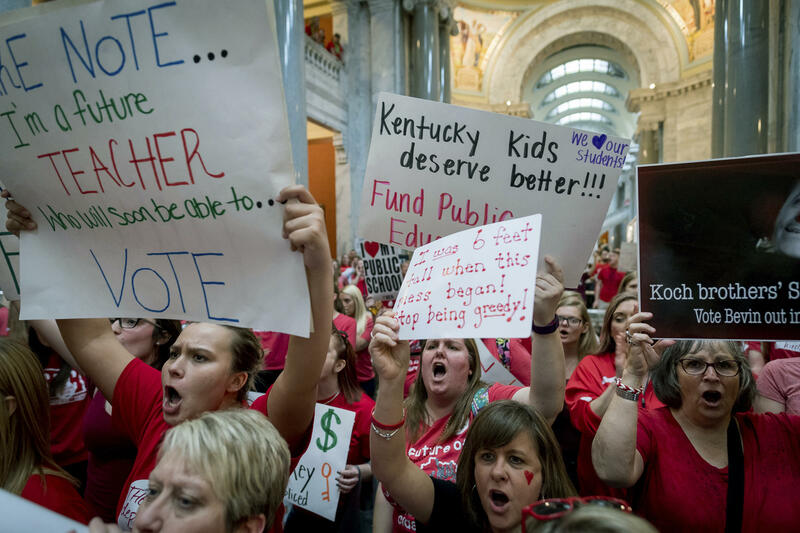 The vote came as thousands of teachers rallied inside and outside the Capitol, forcing more than 30 school districts to close as Kentucky continued the chorus of teacher protests across the country. The rally took on a festival-like atmosphere as some teachers sat in lawn chairs or sprawled out on blankets. Crosby Stills, Nash and Young's hit "Teach Your Children" bellowed from the loudspeakers. The two-year operating budget includes record new spending for public education, fueled by a 50-cent increase in the cigarette tax and a 6 percent sales tax on some services including home and auto repair. But Republican Gov. Matt Bevin vetoed both the budget and the money in it, calling the bills "sloppy" and "non-transparent." He said they would not raise enough money to cover the new spending. "You can stand here all day and act like you are all for (education) until it comes time to pay for it. Well that's a coward," said Republican Rep. Regina Huff, a middle school special education teacher. "We have to have this revenue to fund our schools." "Crickets," Bevin tweeted, adding he vowed to call a special session to pass a new budget if lawmakers approved his vetoes. Republican Rep. Jeff Hoover told his colleagues not to trust Bevin, reminding them the governor promised to call a special session last year to change the state's struggling pension system, but never did. "The only reason we did not have a special session last year is because Jeff Hoover, a married man, was sexually involved with a very young, single member of his staff and was paying hush money to hide his actions," Bevin responded on Twitter. Hoover resigned his leadership position in January. Tuesday, he agreed to pay a $1,000 fine and a public reprimand from the Legislative Ethics Commission. Earlier this month, art teacher Laurissa Kovacs told CBS News correspondent Omar Villafranca that her kids aren't getting the basics at Puterbaugh Middle School in McAlester. Kentucky teachers haven't asked for a raise. They are instead focused on a battle over their pensions. Kentucky has one of the worst-funded pension systems in the country, with the state at least $41 billion short of what it needs to pay retirement benefits over the next 30 years. Earlier this month when lawmakers voted to pass a bill that preserves benefits or most workers but moves new hires into a hybrid plan. Opponents worry this will discourage young people from becoming teachers. The pension changes have already drawn a court challenge.